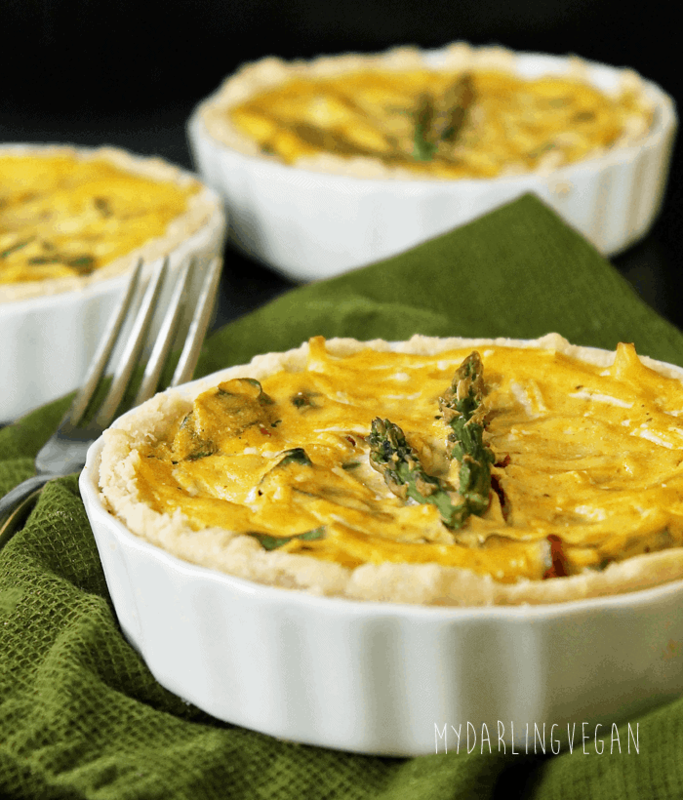 A fresh and seasonal Sun-Dried Tomato and Asparagus Vegan Quiche made with sun-dried tomatoes and asparagus for a hearty breakfast, lunch, or dinner. Hey, friends! It’s been awhile. The last couple of weeks have been tough. Aside from dealing with some very difficult personal matters, the past few weeks have been a scramble to get the airbnb ready – (which it is and booked through the month!) and to get Eden into a preschool for the fall and complete the incredible amounts of preschool paperwork (seriously, this is not like growing up in a small town in the 80s). With these immediate needs requiring my attention, it was time to step away from the blog. Now that I have had some time to re-group, deep clean my kitchen, and dust off my computer I am ready to return. And a few things have changed since I’ve last stopped by. I turned 33. While I could easily be tempted to feel like 33 is just a little older than I’d like to be, my year has started off pretty good with two separate incidences of people, upon finding out I have two kids, exclaiming, “but you don’t look a day over 24!”. It’s the vegan diet, people. I got a new tattoo for my birthday – first one in 5 years – of a doug fir on my forearm. I’m a pretty big fan of it. But most importantly of all, winter is over and spring is here! Felt like a long time coming, didn’t it? Now that spring is finally here, I’m craving all kinds of new foods that the long winter months often make me forget about. 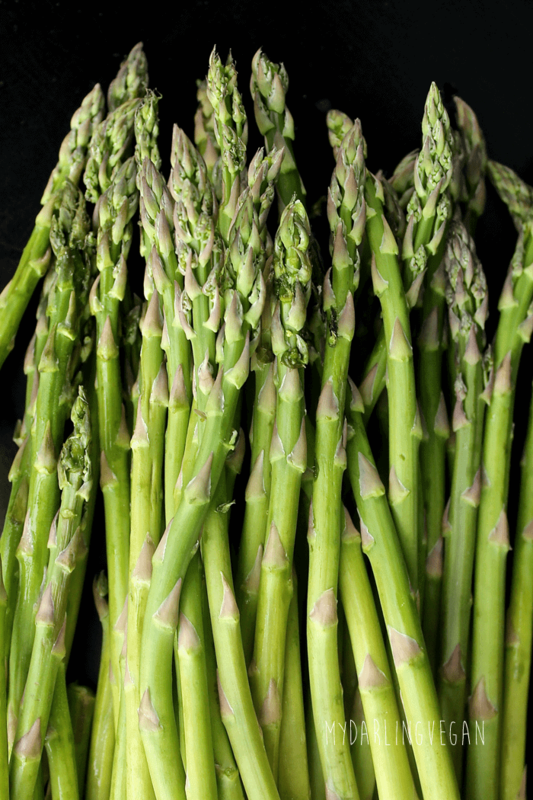 And of course, at the top of that list of newly craveable foods is asparagus. I’m finding the urge to put asparagus in and on everything. It’s hard not to when everywhere I look I see bountiful bundles of beautiful asparagus. And with such a short few weeks that the vegetable is actually in season, it would be a shame not to eat it every single day for the next month. 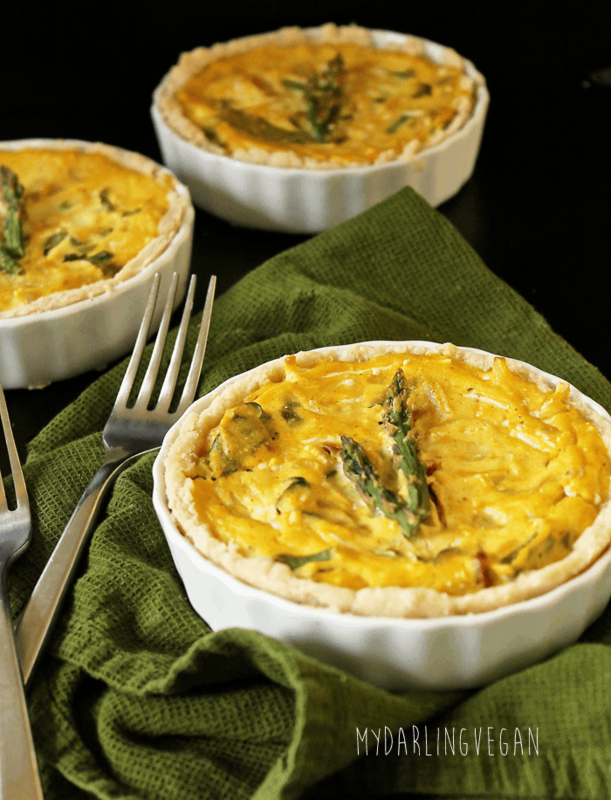 This Sun-Dried Tomato and Asparagus Vegan Quiche was originally scheduled before Easter because it makes a delicious entree to an Easter Brunch and has long time been a holiday staple, but as I said earlier, life got the best of me and this mostly-done post has just been hanging out in my drafts folder for several weeks (along with an Easter round-up and a recipe for white chocolate). 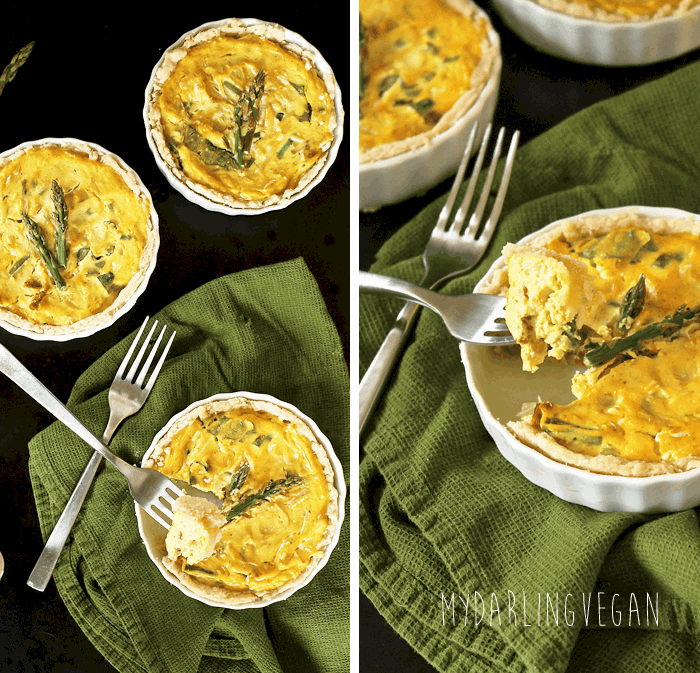 But there’s no actual need for a holiday to whip up this easy vegan quiche. Creamy, rich, and decadent this egg-like custard baked into a flaky pie crust is really perfect for any occasion. So grab a fork and dig in! Spray one 9" pie pan or four 5" mini quiche dishes and set aside. Preheat the oven to 350 degrees F.
To make the crust combine flour and salt in a bowl. Add non-dairy butter in small chunks and with a pastry cutter or your fingers, cut into the dough until it resembles small pea sized pieces (a few larger ones are okay). Add cold water and turn over onto a floured surface to bring together. It will be pretty dry, but should stick together when pressed between your fingers. To make the quiche filling heat 1 tablespoon of oil over medium heat. Add onions and saute until translucent and fragrant (about three minutes). 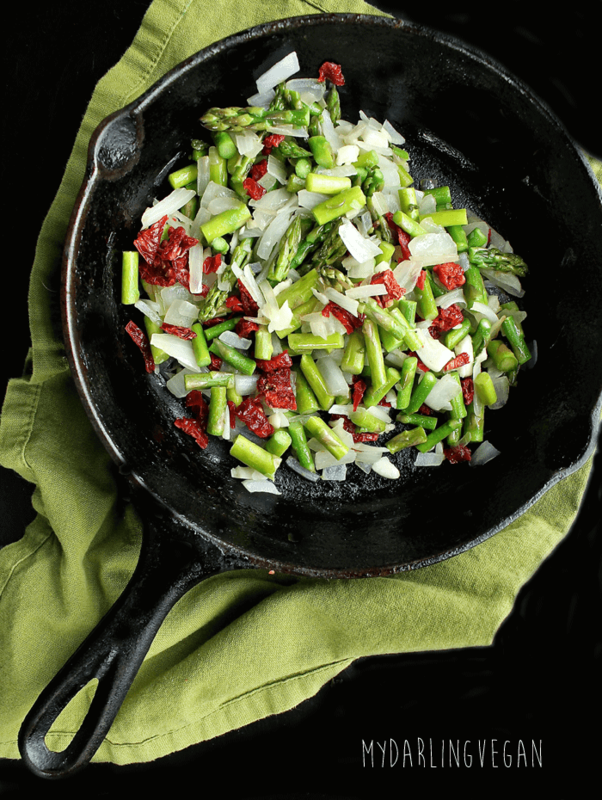 Add asparagus and tomatoes and saute for another three minutes until asparagus becomes slightly tender. Remove from heat and set aside. In a food processor or blender combine tofu, nutritional yeast, non-dairy milk, flour, onions, turmeric, liquid smoke, lemon juice, and sea salt until smooth. Transfer to a bowl. Add asparagus mixture, fresh basil, and vegan cheese and stir everything together. Season with salt and pepper to taste. 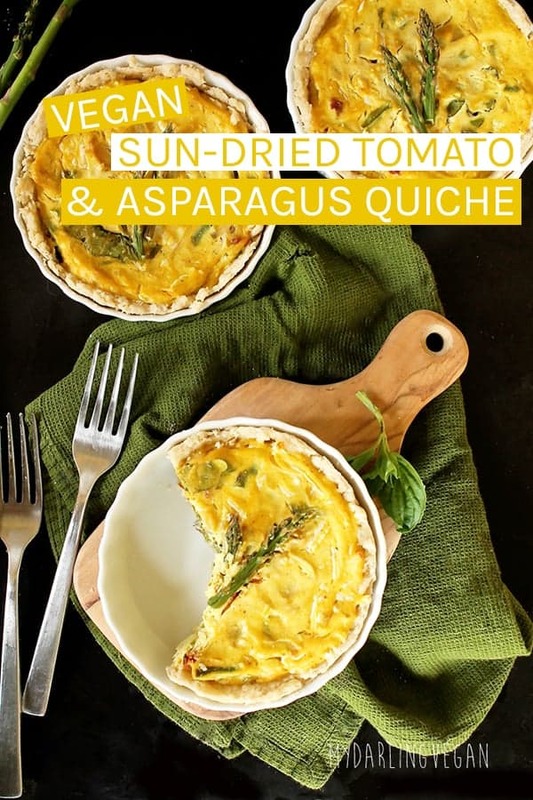 Hi, just wondering if this quiche can be frozen and reheated from frozen. If not, can it be made a couple days ahead. Thanks! I’ve never tried freezing and reheating. It definitely would be best made the day of. Made this for my vegan co worker for her Birthday. Everyone in the office loved it! Oh yum! Looks amazing. I wonder how long this would keep though? This looks like it would be perfect for my spring wedding, I just wonder if it could be made at least a couple of days in advance and frozen(/refrigerated), or whether it would have to be made the day before the wedding. Hello, just wondering if you attempted to freeze this recipe? Thinking about trying to make it in advance myself:) thank you! Saw this on instagram and just had to make it! It look delicious and cant wait to make this for dinner tomorrow night, Yum! and dry it, then whiz it up in the vitamix, and it makes the nicest flour.